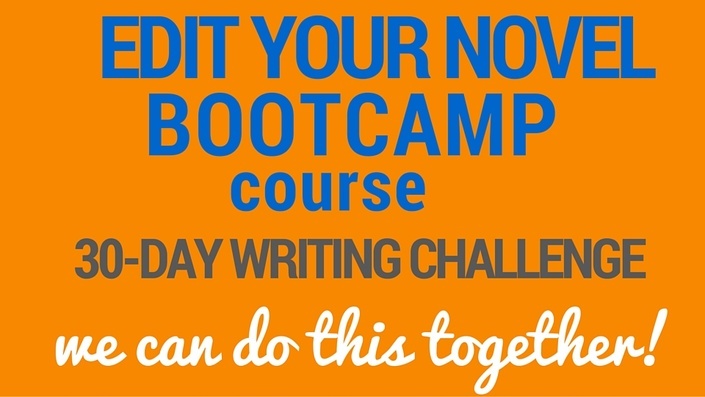 This is a 30-day writing challenge course on editing your Nanowrimo novel. In this intensive homestudy bootcamp course, you will read and edit your novel in four passes. By the time you have completed this course, you will have an edited book that you can present to your critique partners, beta readers, or an agent or editor. -- Beginning writers who have completed a genre novel and want the support of a group and guidance of a class structure while they edit their own book. -- Experienced authors who need the rigor of structure to polish their books, so they can deliver it to an agent, editor, or their beta readers. "Beth & Ezra are inspiring and amazing coaches. They are able to "zoom in" on an individual writer's blocks, at the same time providing a group process that allows everyone in their classes to benefit. Beth's ability to support and gently challenge her authors is wonderful and led me--as I'm sure it has led many others--to uncover layers of character motivation that I had not been aware of in my novel. I highly recommend Beth & Ezra's coaching workshops!" We ask you to assess your writing and we provide guidance and checklists to help you do so. We will guide you through making sure your story moves at a good pace, your scenes work, and that your story structure works for your genre. We will help you make sure your characters are consistent, their motivations are clear, well-founded, and fit their goals and the genre, and that the right amount of backstory is revealed at the right moment. We will help you uncover your overused words, suggest fixes, and help you train your eye for easy-to-miss and common grammatical and punctuation errors. "I really loved the videos and wish there were more of them! You guys played off so well against each other and delivered such amazing writing nuggets - more of that! And I loved the one-on-one action feel, the way you always responded to everything people posted on the lessons. I thought this was an amazing course." -- You have a manuscript that you can approach with a clear head and heart. -- You really want to create an editing system that works for you. -- You're eager to get a manuscript edited. What to do about overwhelm and confusion about the editing process? We get it. Ezra and I have edited lots and lots of novels -- each others', our own, and many of our clients. Editing can feel daunting, but it doesn't have to. We have been where you've been and found ways to make friends with the process, as well with all the feelings of doubt and confusion that arise. We'll be with you every step of the way. What you need is the mindset that you can find a way through this process; that you can make editing your own, and that you can face the difficult emotions and have compassion for yourself. We all get overwhelmed by the process, then we take a deep breath and take things one step at a time. We will help you with each step. And we walk our talk -- both of us will be editing novels alongside you. We're right there in the trenches with you. You are not alone. We can do this together! — This course is for motivated writers who want the added support of experienced teachers and mentors, who are also novelists: Ezra Barany and I, Beth Barany. Yep, we’re married, and actually met at a fiction writing group 17+ years ago. We are offering this course because, one, our students requested it!, and two, it's a challenge we're up for, since we have edited over four dozen manuscripts between us. We have the experience, and we want to pass on our knowledge to you. -- We won't edit your book in this course, but teach you how. -- This is not a peer-critique group, though you may find peers to trade manuscripts. -- We are not the arbiters of what your book needs to be; you are, and we have strategies to help you determine what's best for your book. -- We can't tell you when your book is complete, but as mentioned above, we have strategies to help you determine that. Beth and Ezra Barany are award-winning, best-selling novelists, who have worked with over 100 authors to help them get their books written and published. Happily married for over 15 years, we’re passionate about writing, story telling, and guiding authors to achieve your dreams. Together we have written and published 19 books, plus 3 audio books. Together and separately, we have taught thousands of students over the years, in both the public and private sector, including overseas in Paris, France. We both teach (and in Beth’s case, coach) and are working on writing and publishing our novels. Beth has written and published 4 novellas, 3 novels, a collection of the romance novellas, a short story, and a novel prequel in the last few years. She also has more books coming out in 2016. Beth has used this process successfully to edit each of her 5 novellas and 5 novels. Beth has taught these tools to other authors and has seen how effective they are. Ezra has written and edited 4 novels and hundreds of short stories. He successfully uses the techniques that we teach. Ezra has published 2 thrillers and is editing the third in his series during this course. Ezra and I want to support authors who want support, know they learn best in small, hands-on learning environments, and who want to have a career as novelists. If that’s you, we really want you in our course. Short Quiz: What is your learning style? Short Quiz: What is your preferred process? Organized in a 4-week structure. Turbo charge your progress with a consult with Beth. Get your first chapter reviewed! Perfect for the ambitious writer who wants feedback, support, and is ready for one-on-one coaching and developmental editing to refine their story and get ready for publication.